I love vintage Valentines. They are so ornate and beautiful. The quality of today's cheap commercial valentine's for kids are quite frankly a huge disappointment to me. 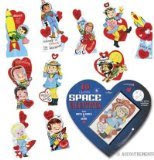 But, actual antique valentines are usually quite costly to buy from dealers. 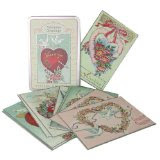 So I've searched around and found a few different options for new Valentines with an antique, classic feel. Here are a few old-fashioned Valentine's available for purchase. Hope you enjoy! Why limit yourself to vintage valentines? Modern designs can have a special meaning too. Yes, there are many modern valentines that are gorgeous. The theme of my post was vintage valentines so that's why only vintage styles were covered.